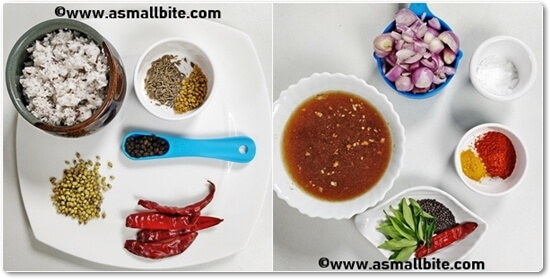 Ulli Theeyal Recipe / Kerala Style Ulli Theeyal, with step by step pics and YouTube video. 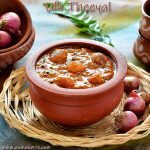 Theeyal is a South Indian dish originating from the Indian state of Kerala. 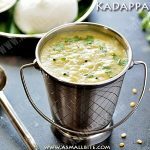 It is quite similar to sambar and is made from a mixture of spices consisting of roasted coconut, coriander seeds, red chilli and methi seeds. All the spices are grounded to a paste and cooked in tamarind water (Source: Wiki). Another meaning for ‘Theeyal’ is “burnt dish” which is a typical Kerala dish featuring burnt coconut and is usually dark brown in colour and in some parts of Kerala, theeyal is included in the Onam Sadhya Menu. 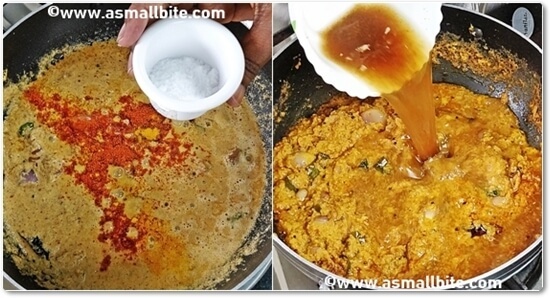 I have tasted this gravy in restaurants in the Onam Sadhya feast, but this is the first time I am preparing in my kitchen. It was really tongue smacking with hot rice and I am sure that I will make it again. 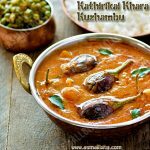 Please do check the Kerala parippu Curry and Kerala Nendran chips recipes in my blog which was a super duper hit ……. 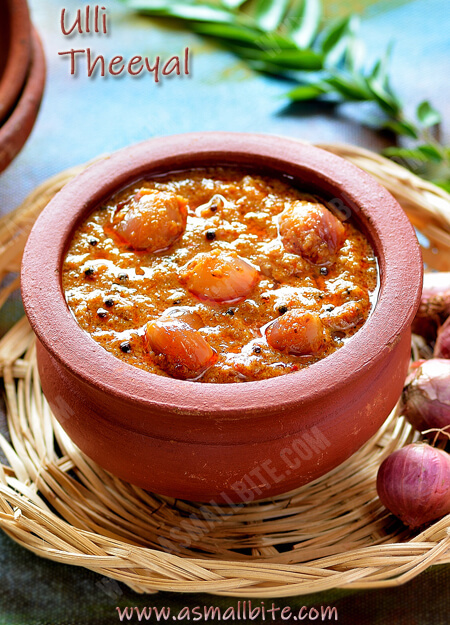 Kerala Style Ulli Theeyal recipe is a dish originated from Kerala. 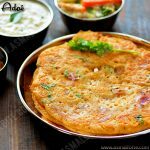 It is made from spices like roasted coconut, coriander seeds, red chilli and methi seeds. First, measure and keep all the ingredients ready for roasting. Then soak tamarind in 1 cup of hot water for 20 minutes. Extract tamarind juice and discard the pulp. Peel the skin of shallots and chop it. 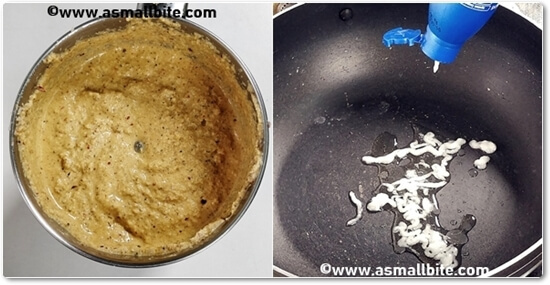 Heat oil in a pan, add pepper corns, jeera, methi seeds and roast till nice smell wafts. Then add red chilli and grated coconut. Furthermore, roast the coconut for 3 to 4 mins in a very low flame, until it turns to a nice brown colour. While be little careful in roasting the coconut, never burn it or change to black colour, as the whole taste gets spoiled. Once it cools down, transfer it to a mixer. Pour very little water and grind it to a smooth paste. Heat coconut oil in a pan. Add mustard seeds, once it splutters, add red chilli and curry leaves. Then add chopped shallots and saute till translucent. Now pour the grounded coconut paste, turmeric powder and chilli powder. Add required salt, mix everything well and cook for about 5 minutes. Now pour the tamarind juice. To dilute the gravy, pour 1/2 cup of water. Cook covered for about 7 to 8 mins, till the oil floats on top and the gravy thickens a little. 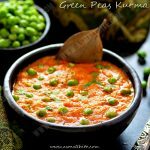 Serve this Ulli Theeyal Recipe with Beans Mezhukkupuratti as a side dish. 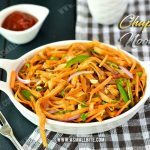 Use shallots / small onions only, you can use it as whole or chop into pieces also. Never use regular/big onions for this recipe. Ensure not to burn anything when roasting, otherwise, the whole taste gets spoiled. Do the roasting in low flame only. Furthermore, tempering in coconut oil lends a traditional flavour and taste to the gravy. 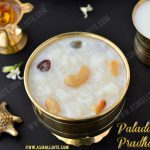 Also, use good quality coconut oil to get a good taste for this Kerala style ulli theeyal. Adjust red chilli, red chilli powder and peppercorns as per spice level preferred. 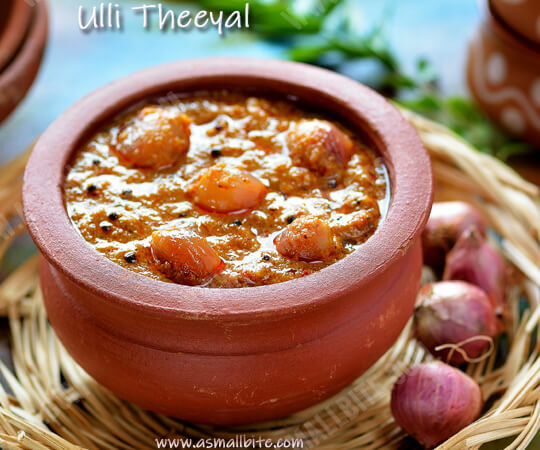 The shelf life of this ulli theeyal recipe is 2 to 3 days under refrigeration. 1. First, measure and keep all the ingredients ready for roasting. Then soak tamarind in 1 cup of hot water for 20 minutes. Extract tamarind juice and discard the pulp. Peel the skin of shallots and chop it. 2. Heat oil in a pan, add pepper corns, jeera, methi seeds and roast till nice smell wafts. 3. Then add red chilli and grated coconut. 4. Furthermore, roast the coconut for 3 to 4 mins in a very low flame, until it turns to a nice brown colour. While, be little careful in roasting the coconut, never burn it or change to black colour, as the whole taste gets spoiled. Once it cools down, transfer it to a mixer. 5. Pour very little water and grind it to a smooth paste. Heat coconut oil in a pan. 6. 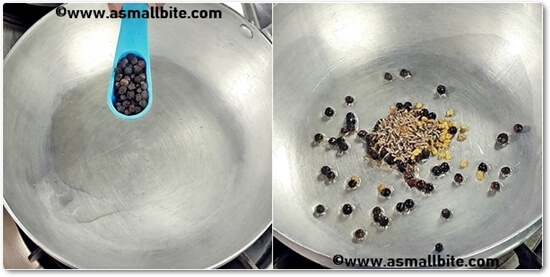 Add mustard seeds, once it splutters, add red chilli and curry leaves. Then add chopped shallots and saute till translucent. 7. Now pour the grounded coconut paste, turmeric powder and chilli powder. 8. Add required salt, mix everything well and cook for about 5 minutes. Now pour the tamarind juice. 9. To dilute the gravy, pour 1/2 cup of water. Cook covered for about 7 to 8 mins, till the oil floats on top and the gravy thickens a little.